I’m not doing what I set out to in our new space. (Still loving it by the way.) I set out to post more and I will but not yet. You see, I had a fabulous weekend. Greg and I spent needed quality time together since he worked late most of last week. He basically came home, showered and went to bed to get up at 4:30 again. This week is another story. He has a doctor appointment (afternoon off) for an injured portion of his neck and I get my wisdom teeth out Thursday. He gets to take care of me. His threats to puree all of my food have me worried. He thinks it’s hilarious while I’m wondering how loopy I will be so that he could make that a reality. So this awesome weekend was much needed. We walked many miles around town in search of garage sales Saturday. Just wasn’t the right weekend for that-we only found a tarp to use for paint projects. Sunburns and blisters would be the title of our trip if I were to write a book (which this post nearly is). We stayed in and watched a few movies that night. 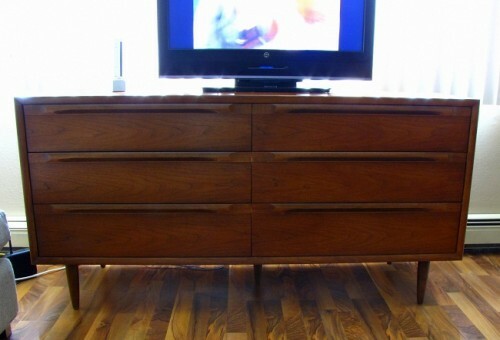 Sunday morning I found the credenza of my dreams on craigslist with a side table for $65…2 hours away. No worries. We were up for the trip. The guy selling the pieces had plans to go to the Twins baseball game so we took our time, stopping in a few other towns along the way to explore. Our first pause was Anoka (Minnesota) where we found Truffles and Tortes Dessert Café. 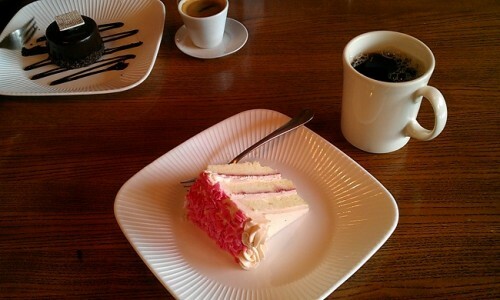 Couldn’t pass up a cup of coffee with a slice of strawberry cream cake and dark chocolate cream with banana cake. Delicious! After a few vintage/antique stores, we went to Big Lake. A nice beach and park area were along our route so we pulled over to investigate but were disappointed that we had to pay for parking for such a small park (shouldn’t taxes cover this). The day was a little chilly but we walked amongst the teens and bird droppings-stopping to sit on a picnic table to gaze at the boaters. A good breather but nothing extraordinary. It was getting late so we finally went through Becker to St. Cloud where we drove around in search of a smokehouse restaurant. Didn’t find that but we did spot the Electric Fetus music store (my sister is a fan) and after a quick snapshot, we checked out the rest of the town. Seems like a nice place. They had a rather large bookstore (closed on this Sunday evening) that I would travel to check out again. Not hearing back from the guy yet, Greg and I grabbed a pint at MC’s Dugout (oh and buffalo chicken nachos to share…not the healthiest day). Perfect timing because just as we were finishing, the man called to tell us he was back home from the game. One glance of these pieces and I was in love. The man couldn’t have been nicer. He is a retired college counselor that goes to flea markets and auctions in search of great furniture. He gave me his info and I now have a furniture dealer-someone to help me find what I want. I can’t believe that. The drive home was lovely with blue skies and cotton candy clouds. Once we toted the heavy dresser and table up the 3 floors to our apartment, Greg and I sat in awe. So that’s where my mind is-not nearly as much on food as decoration. I’m contemplating starting a décor blog but I can’t think of a name. What I am preparing these days is on the healthy side. 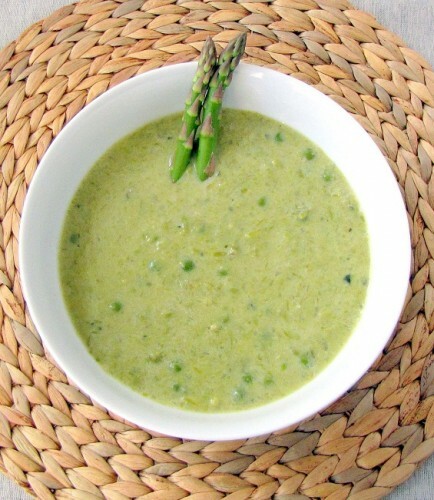 Of course I’m using fresh spring produce while it’s here and I’m stocking the recipes that fall into this category, such as, the asparagus soup from the March issue of Food & Wine magazine. I didn’t make the Parmesan shortbread to top it off because I didn’t see the need with the great flavors the soup held alone. The only change I would recommend is to use a ½ cup of heavy cream in place of the ¾ cup. The excess simply wasn’t necessary. With most asparagus dishes the controversy lies in whether or not to rid of the woody portions of the stem by breaking/chopping them off or peeling or whether to use the entire stalk. Since the soup is pureed in the end, I didn’t chop, break or peel mine but if you are worried about woody splinters injuring your diners, feel free to do so. Pureed food is in my near future and if it tastes as good as this soup then I’ll be in good shape but something tells me Greg’s idea of what to puree would make my stomach churn. 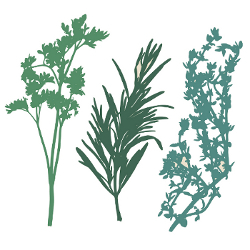 Add the tarragon leaves and parsley. Working in batches, puree the soup in a blender or food processor. Return the soup to the pot, add the peas and cream. Keep the soup on low (warm) until serving. Season with salt and pepper. Good luck on the wisdom teeth. If it’s any comfort, when I got mine out (only two, granted) I only had the need for one Vicodin the next day. After that I may have taken some aspirin for a day or two but really what was worse was the weird feeling of the space where the teeth had been. I couldn’t stop my tongue from running over the area on a regular basis for awhile. No dry sockets. Hope all goes well and milk it for all it’s worth. Lovely furniture, pretty soup and a good recollection of a well-spent weekend. I’ll be thinking of you as you recover from your surgery. I remember it took me a while to get over my wisdom teeth removal. Thanks for sharing your creative self with me tonight! I hope you have a beautiful day tomorrow.